GET READY FOR SOME BREAK THROUGH BANKING! BUNQ, an amazing group of IT and dream driven boys & girls, is determined to change the financial system. DRAMA, HEATED ARGUMENTS and EXTREME PASSION define bunq’s TRIALS and TRIBULATIONS. Against all odds they’re breaking free from the status quo. Let's break free from the status quo. And experience life. On our own terms. bunq is not just a bank. It’s a completely new approach to everyday money. 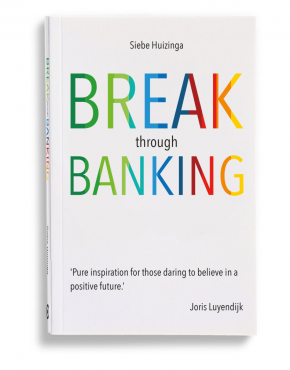 Download our bestselling e-book BREAK THROUGH BANKING. Or get the Dutch edition: BREKEN MET BANKEN. ‘Banks,’ says Ali, ‘are money machines. They attract money at the cheapest possible rate, then go on and sell it for as much as they can. It’s buy-and-sell, just like your local car dealer. A car dealer promotes his cars by claiming how reliable they are. Somehow, a car has always been owned by an old lady that only used it for her weekly shopping trips.